Astounding hypocrisy, self-censorship, and complicity by the West regarding one of the most regressive regimes on Earth. The Cooperation Council for the Arab States of the Gulf (GCC) comprises of 6 nations, Saudi Arabia, Qatar, Bahrain, Kuwait, the United Arab Emirates, and Oman. In principle, Kuwait and Bahrain are considered “constitutional monarchs,” in practice, all 6 are despotic autocracies with Saudi Arabia, Qatar, the United Arab Emirates, and Oman overtly “absolute monarchs.” Devoid of even a feigned semblance of representative governance, these regimes brutally repress not only their own subjects, but play active roles in repressing the people of other nations, both on their borders and well beyond them. Saudi Arabia and Qatar are playing an active role in crushing dissent in neighboring Bahrain – an opaque uprising obscured by a lack of Western media coverage – apparently the result of Western press houses conveniently ignoring unrest targeting governments linked to Western interests, while intentionally subverting nations opposed to Western interests. Image: A map of the GCC’s members, a collection of interconnected absolute monarchies guilty of serial crimes against humanity both at home and abroad, for decades. We are now expected to believe this criminal collaboration is promoting “democracy” in both Libya and now Syria by sending in legions of armed sectarian militants, when not even a feigned semblance of democracy exists within their own borders. Likewise, the collective efforts of the GCC’s regimes have torn North Africa’s nation of Libya apart, leaving it under the control of roving bands of NATO/GCC-armed and funded genocidal sectarian militants with the Tripoli government dominated by Western proxies. A similar operation is now underway in Syria, also fully funded, armed, and directed by the GCC and its Western minders. The term “pro-democracy” has been disingenuously used to describe the militant legions that very “undemocratic” nations like Saudi Arabia and Qatar are underwriting. Clearly, even at face value, this is an untenable narrative. Under closer scrutiny, it unravels further, exposing a criminal, murderously violent, terroristic conspiracy of vast international proportions. 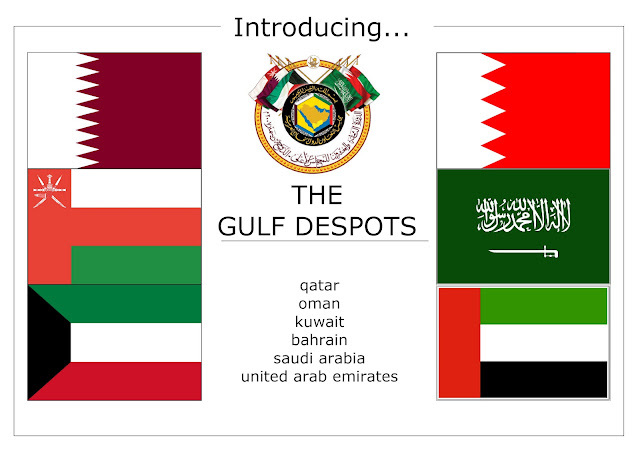 Of the GCC, perhaps the two most prominent members are Saudi Arabia and Qatar, with the House of Saud leading, and the Qataris playing a supporting role, mainly in terms of propaganda via state-owned Al Jazeera, by hosting “defectors,” and hosting the regional headquarters of Western corporate-financier funded think-tanks like the Brookings Institution’s Doha Centre. 2. To this day, Saudi Arabia carries out barbaric executions against both criminals and political enemies, including victims accused of “sorcery and witchcraft” in the aptly named, “Chop-Chop Square” located in the capital of Riyadh where heads are literally chopped off by hooded swordsmen. 3. Women are banned from driving in Saudi Arabia, and most likely would also be banned from voting in national elections, if such a phenomenon even occurred – which it does not – as Saudi Arabia is an absolute monarchy and its leaders are determined by heredity, not even the feigned pretense of elections. There are local elections, however, in which woman are not permitted to vote (perhaps in 2015?). 4. Saudi Arabia has been and to this day is the primary underwriter of the notorious international terror organization, Al Qaeda. Created along with Saudi Arabia’s long-time ally, the United States, money, weapons, and directives are laundered through the Saudis to maintain both plausible deniability for the Americans, and to maintain a degree of credibility for Al Qaeda’s sectarian extremist foot-soldiers across the Muslim World. 6. Saudi Arabian corporate-financier interests (run by the royal family) are tied directly to Wall Street and London via conglomerations like the US-Saudi Arabian Business Council and representation upon the JP Morgan International Council (Khalid Al-Falih of Saudi Aramco, amongst the highest valued companies on Earth). 7. The alleged most notorious terrorist in modern history, Osama Bin Laden, was a creation of US-Saudi machinations, with the Bin Laden family to this day being a premier member of of both Saudi and Western elitist circles. The multi-billion dollar Saudi Binladin Group is an active member of the US-Saudi Arabian Business Council and plays a central role in deciding bilateral policy for the benefit of collective US-Saudi corporate-financier and corresponding geopolitical interests. 9. Saudi Arabia has played an active role in the violent destabilization of governments around the world, including most recently Libya and Syria. The use of sectarian-extremists indoctrinated at Saudi-funded faux-mosques and madrasas, armed and funded by Saudi cash, is the standard method of operation for these destabilizations. 10. Saudi Arabia’s brutally repressive internal security apparatus is a creation of US advisers and operators. Its military, both covert and conventional, is also armed through astronomically large weapons sales (including a recent sale considered the largest in US history) by its Wall Street and London allies. The atrocities committed by the despotic Saud regime are directly facilitated by US advisers, operators, and arms. Saudi Arabia also hosts the US military, a sizable force until it was spread out amongst the orbiting despotic regimes of Qatar, Bahrain, Oman, and the United Arab Emirates. Of course, not everyone in Saudi Arabia is a barbaric, treasonous, meddling despot. This includes people all across Saudi Arabia’s population of 28 million and even throughout its government. Many of these people have attempted to protest or reform the current state of the “kingdom,” albeit very unsuccessfully. This failure can be in part blamed on the vast, draconian police state created for the House of Saud despots by their Western sponsors as well as a Western media complicit in censoring crackdowns on protesters, most recently unfolding in the eastern city of Qatif, and a virtual media “black hole” in regards to covering anything, good or bad, regarding Saudi Arabia. The key to breaking this self-imposed Western media blockade is for the alternative media to conduct the research and cover developments themselves. This includes reaching out to activists and reformers within Saudi Arabia, Qatar, and the other GCC autocracies and giving the people the platform denied to them by the corporate-funded Western media. Image: The Fortune 500 has an array of faux-human rights organizations from North Africa to the Middle East, from Eastern Europe to East Asia – perhaps it is time for people to begin organizing themselves into independent institutions that truly defend human rights and freedom, while implementing an agenda of the majority. A possible “International Observatory for Gulf State Despotism” would seek to break the Western media’s blockade on information regarding the GCC, serving as a clearinghouse for information on abuses, repression, and meddling both at home and abroad. If you are from the GCC region, please contact LD at [email protected] with any information, issues, corrections or concerns. There may be a possible “International Observatory for Gulf State Despotism” created specifically to give voices to the people under the rule of the GCC. Please exercise good judgement and caution – as these are real despots and have put many people to death for questioning their undisputed rule or opposing the progress of their medieval machinations.